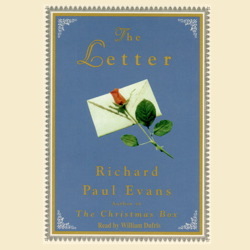 The Letter, the final book of the Christmas Box collection is, most simply stated, the love story of David and MaryAnne Parkin. But it is also everyone's love story, for it is about the storms that all relationships must face when the blissful state of romance vanishes into one of real-life challenges and difficulties. We often forget that it is in the hard times that we truly see what is best in love as well as in life. Though love may be temporarily darkened, true love never gives in, or up, but holds tight to noble ideas, which transcend this earth and all time. My hope is that you will feel what I felt as I wrote this book -- the divine nature of loyalty and the understanding of why we must share love whenever and wherever. One final note. I am saddened to finish the Christmas Box trilogy and to bid good-bye to the Parkin family. I do not know if I shall ever visit them again, but I am glad for this last story -- a story which I think is a fitting sendoff for the characters I've grown to love. I hope that the message you find in their lives is meaningful to your own. And, most of all, that in reading the Christmas Box collection, you, and those with whom you share my books, will never be the same.